Often times, startups put all of their eggs into the paid media basket. Why? Paid media is one of the easiest forms of marketing to measure and forecast results, thus, many think it provides the best and most cost-effective way to drive traffic and potential customers. And while in some cases this may be true, the best strategies around marketing and PR for startups today means leveraging paid media alongside owned and earned media. Balance, as with everything in life, is the key to successful marketing. Relying too much on any one type of media is not going to give your startup the reach you need to be noticed. Truthfully you need three to make a meaningful and impactful marketing strategy. 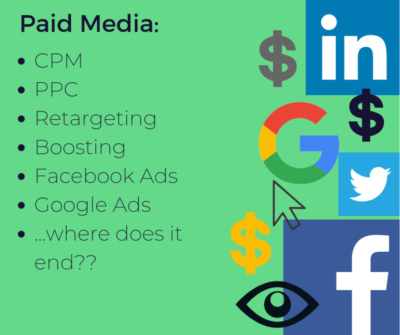 Let’s take a look at paid, earned, and owned media and see how they can work separately and together to help you drive growth for your startup. Owned media is exactly what it sounds like: you own it. Owned media is original content that you create and includes your website, social media, and blog. Content marketing helps you establish trust, authority, and thought leadership. It provides value to customers and prospects, and when done right, can guide people along the buyer journey. It can also come in handy when looking to scale other parts of your marketing efforts. More on that later. While there are no guarantees of traffic, clicks, or shares, putting time into developing quality content and building an audience is still well worth the trouble. It may not be as easy as creating an ad for Facebook and letting the platform serve it up for you, but good content provides a lot more return in the long run. And, of course, it’s free! A steady cadence of quality content cannot only help people discover you by boosting your SEO, but it can also build your reputation and perception by providing value to those who consume it. In fact, with so much information at our disposal, and an endless array of companies to choose to do business with, content marketing is key to building meaningful relationships — even with media. And while it takes time to create and scale, quality content marketing programs will always pay off in the end. And, of course, they’re free! Protip: Leverage the unique data your startup has access to create compelling data stories within your owned content. At BMV, we highly encourage startups to develop data pieces to gain insights into their industry. Data pieces can offer your following interesting and relevant information about your market and maybe even the world around them, without making you seem self-serving. In addition, these data-driven pieces can then be used to illuminate trends, surface interesting stories and can even be used to later to secure earned coverage from media. Many believe paid media is the gold mine for growth. It’s certainly guaranteed to expand your reach. Who doesn’t love that? However, the downside is that it generally isn’t as trusted as much as owned and earned media. And reach doesn’t always equal growth. Pay-per-click (PPC, for short) ads are exactly what they sound like: you only pay for them when someone clicks on the ad. These are mostly text-based ads, that appear on the top of your Google Searches or on the right side of your Facebook feed. CPM ads are the pay-per-view of online advertising. These are billed at a rate of 1,000 impressions. Most CPMs are visual (think of banner ads) and you don’t get charged for any clicks on the ad. While inexpensive, these ads are harder to track than others and don’t always drive the web traffic people are looking for. Retargeting ads use cookie-based technology to target people who have already expressed interest in your company or product. Retargeting ads take the people who have visited your website and then follow them around the web, serving them ads. This can be a very effective strategy if your website gets high traffic. Boosting posts on social media is the simplest form of paid advertising. Facebook, Instagram, LinkedIn, and Twitter all have a boosting feature that you can use to make your posts more visible. If you don’t know where to begin and aren’t really sure of what you’re doing, this could be a great place to start. The number of strategies you can take when it comes to ad campaigns is nearly limitless. If you’re simply looking to generate awareness and drive traffic to your website, you can run ads on social media platforms that your audience frequents, promoting products and services. But when done right, paid ads can act as a forcing mechanism to drive very specific actions. For example, you could go for a retargeting campaign to take the people who have engaged with your company in some way to take those final steps along the buyer’s journey. We’ve all been retargeted in this way. When you start seeing ads for products that you’ve clicked on or viewed somewhere following you around on the internet you’re being retargeted. The thinking is that once you’ve expressed interest in something you are far more likely to buy a product or service if you see it again, and it works. Reportedly customers who were served retargeted ads are 70% more likely to make a purchase than ones who were not served retargeted ads, and some people even like retargeting ads – 30% of people generally have positive reactions to them. In short, yes paid ads are great. They do provide instant gratification. But beware. Click through rates might jump, but as we mentioned before if you don’t provide your viewers with valuable information on your website or blog, then the clicks will end up being meaningless. Focus on the quality of the information and interactions, rather than the number of clicks you get. For more on the dangers of investing too much in paid ads, click here. Protip: A critical piece of paid advertising is knowing who you’re targeting. To not waste time and dollars, you should develop a buyer persona. Buyer personas are a “made up character” that represents your ideal customer. When you create a buyer persona, you should think about demographics, behavior patterns, motivation, and goals. By developing a detailed buyer persona, your startup can determine what the best way is to spend your time, develop your product, and how and where to spend advertising dollars. Earned Media is the hardest of the three to obtain, but when executed effectively it can have a return on investment that is unattainable with both owned and paid media. When we talk about earned media, we are talking about driving media placements and mentions across newspapers, online publications, TV, podcasts, etc via influence. The hard part about earned media is that it can be a lot of work for something that isn’t guaranteed. Of the three strategies, it is the hardest to forecast. It requires combining a knack for storytelling with a deep understanding of the media landscape. In short, you need to find the right media angle, for the right journalist, at the right time. Or the right pr agency for startups. Something that is MUCH easier said than done. The fact that the news cycle is so fleeting means that even if you do get a mention in the media, there’s a chance people will not remember it tomorrow. Finding ways to scale media programs and keep companies in the conversations they need to be in is where the pros separate themselves from the rest. According to Nielsen’s Global Trust in Advertising Survey, 66% of people trust earned media in the form of articles whereas only 47% of people trust ads served on search engines and 46% trust ads served on social media sites. When we see something in a publication, we associate it with being more legitimate. Why? Because we have trust in the news media to inform us. Sometimes paid and even owned media can come across as self-serving, which makes people not trust it as much. Earned media, on the other hand, is completely the opposite. Journalists have a way of weeding out companies who tend to be too self-serving, and only want to highlight companies who can offer something to their readers or community. Having a story, mention, or feature on your startup brings you to another level of validation: it means that your company or product is so interesting that an uninvolved 3rd party wants to write about it for a credible publication. 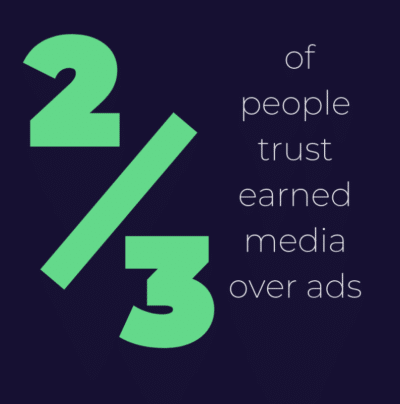 Due to this, we tend to trust earned media more than other types of media. It’s almost like getting a restaurant recommendation from a friend; we take it more seriously when someone we trust refers it to us. It’s the same way with publications. If the New York Times features a specific product, we tend to note that it must be worth the time to look into. As readers, we know the reputation of the New York Times and trust that if it were not worthwhile, then the New York Times wouldn’t write about it. Protip: If these articles, recommendations, or reviews get shared or reposted, even better for you! Getting into a publication like Buzzfeed is extremely valuable since their content gets shared a lot. More shares = more eyes on your startup. Earned: By using your data story as a peg to get in front of journalists (journalists love nothing more than unique data) you end up securing coverage on a top tech publication. Awesome! Just like that, you’ve taken an owned to earned approach and given your data story, subsequently, your company that much more visibility. But it doesn’t have to stop there. Paid: Understanding the powerful ability paid has in driving traffic to your site, you decide to run a Facebook ad (paid) using your earned story as the creative to drive people to your site. After all, nothing is more captivating in the startup world than the Techcrunch logo. You’re now not only in a top-tier publication, but you’re also driving more people to your website by using a paid ad. The ad connects back to the original data story on your website, which, thanks to a lot of worthwhile content marketing, shows that you have a wealth of information that is helpful and valuable to potential customers. They start to follow your social media and blog. Viola, you’ve hit the sweet spot of converged media. Finding this harmonious intersection means everything is working together to maximize your visibility among potential customers and investors, and optimize the return of the resources you’ve put into all three. The best plan plays all three media to each of their strengths. When one type of media isn’t being used or isn’t being used correctly, chances are you aren’t getting the most out of your marketing strategy. The balancing act of using these tree tools is certainly a difficult one and takes times and experience to get it just right. Learning to utilize each type of media and take advantage of the opportunities each one presents can make a huge difference when it comes to getting and maintaining the visibility of your startup. It will take practice, but once you get all three plates spinning and in the air, you’ll find that it creates a successful, consistent string of meaningful connections, media hits, and attention for your startup.